A recent arrival from India, Pogostemon is a stem plant that develops very fine needle-like leaves that are a delightful lime green hue. This Indian beauty looks excellent when combined with red or brown-hued plants. Pogostemon’s growth rate is in the middle range. A cluster of plants can be pruned considerably - the stems will soon grow new side shoots, and the plants will be thicker and more compact. 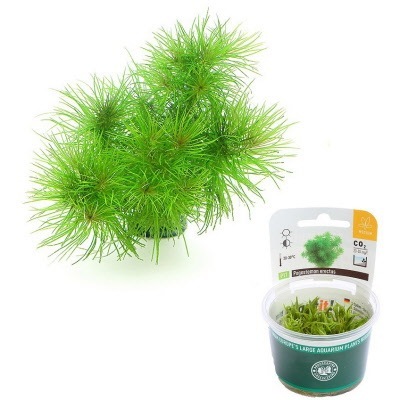 InVitro plants are submersed in 100 percent humidity. Many aquatic plant specimens in the market are emersed, which means the leaves are above the water. These plants die back when they are planted within a tank, and they regrow with the leaves looking different than they did when they were purchased. With In Vitro submerged plantlets, you get constant, uninterrupted growth. 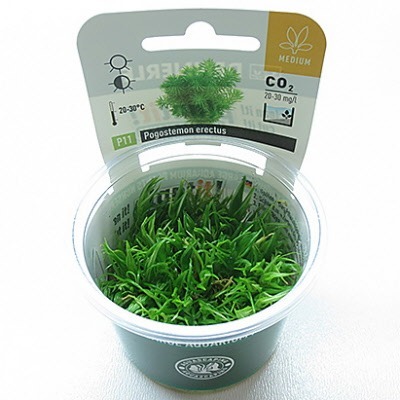 Another benefit to the culture cups is that they contain numerous small plantlets that can be divided out and spread throughout your tank, so you get a lot of value for your money. Note: No international shipping available for this item.